NO MORE LITTER OR BOX! WHAT? So one of our customers decided they didn't want to deal with the litter box any longer. Check out their videos below and read more about how they did it! 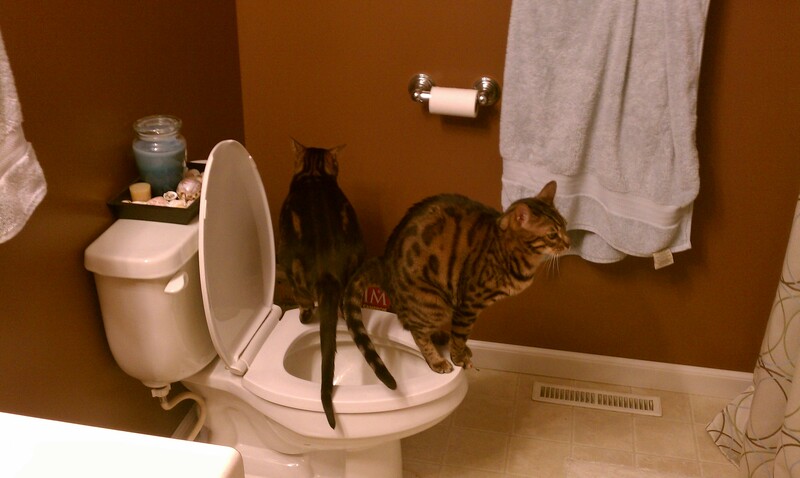 By using the "Litter Kwitter" we were able to train both of our cats that we got from Elkridge Bengals to use our toilet rather than a litter box filled with litter! I know what your thinking, sounds nuts, right! To be honest I thought so too at first! Well, it took us less than 8 weeks for us to train 2 cats! Now not only are we saving the time of not having to deal with a litter box constantly, but we are also saving literally hundreds of dollars a year in litter. Not to mention the joy of not having to deal with the litterbox smell. I will be adding some video soon as "proof" for the nonbelievers. But really I wanted to be sure to share this with others as I know how skeptical of it I was. By simply following the instructions that comes with the Litter Kwitter system our Bengals had no trouble adjusting to their new routine and since their training have been accident free for almost 2 years now! This information was simply to good to keep to myself. Anyhow, I hope you enjoy the videos and thanks again for such amazing cats!